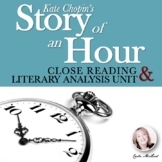 This document contains the text for "The Story of an Hour" by Kate Chopin along with a chart for students to analyze the different types of ironies in the short story. 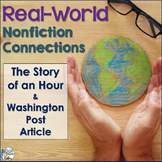 Students will also identify elements of American Realism evident in the story. Teacher's key is included. Fun Activities to accompany the Open Court story Story Hour Starring Megan! This two-day lesson plan invites students into the world of a wife, who has just experienced the loss of her husband. During the first day, students learn how to annotate a story, highlighting important information and employing a variety of reading strategies all to prepare them for the next day. 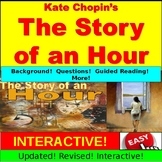 Common Core Lesson Plan: "The Story of an Hour"
This 8-question multiple choice quiz (answers bolded), and 3 assignment options will assess students on the story "The Story of An Hour" by Kate Chopin. Included with the assignment options is a grading scale for each of the three assignment options so students will know how they will be graded. 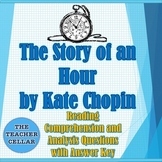 An analysis lesson on the short story "The Story of an Hour" by Kate Chopin. Includes a copy of the story along with analysis questions on characters, plot, setting, and theme in the story. 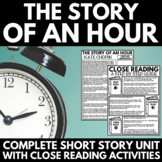 Literary Thesis Worksheet and Key based on "The Story of an Hour"
These are 2 lessons that introduce students to the concepts of characterization through direct and indirect evidence. 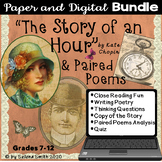 The lessons are based around Kate Chopin's short story, "The Story of an Hour"
Short-answer and multiple-choice questions (11 pages) for Kate Chopin's Story of an Hour and Edith Wharton's April Showers. These are materials are also available as part of the 80-document (and 75-text) set Prentice Hall American Literature Resources.